Museums Sheffield questioned whether Horace Vernet (1789–1863) painted the nineteenth-century French soldier, rather than Claude-Joseph Vernet (1714–1789). The subject was deemed untypical, Claude-Joseph declared an unlikely artist, and the catalogue note suggests Horace Vernet was the true painter. Was this correct? 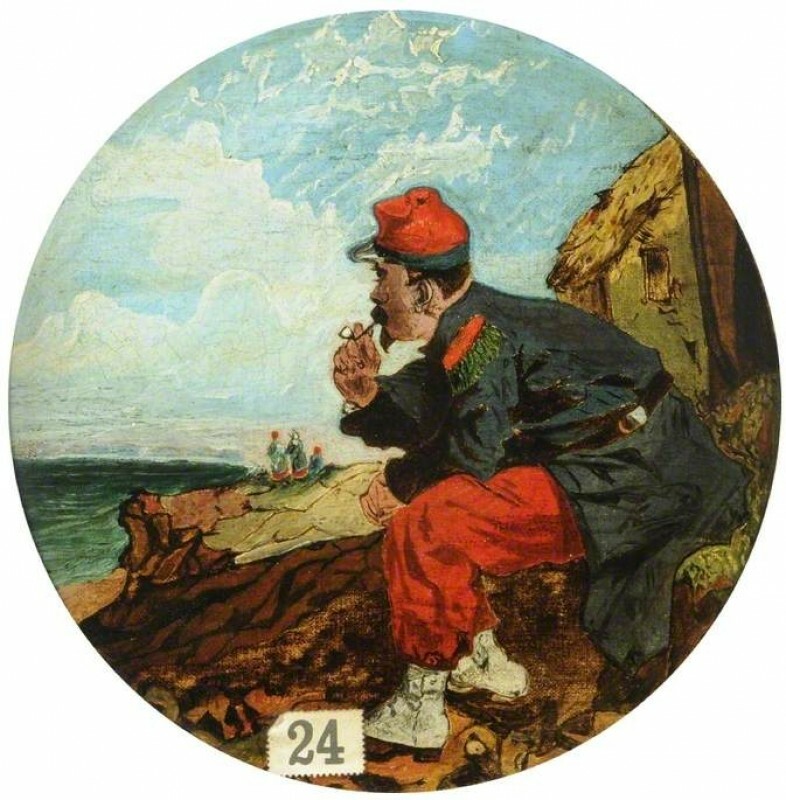 Peter Harrington thought that the figure was of the mid-to-late nineteenth-century, and could be by Horace Vernet, but Toby Campbell said neither Horace nor Claude-Joseph was the artist, favouring an anonymous, amateur painter. Foteini Vlachou suggested Nicolas Toussaint Charlet, who style matched the painting more closely; Peter then dated the uniform to c.1850–1880, drawn from a comparison of lithographs of that period. According to Martin Hopkinson, many French artists sold military subjects in the mid-1900s and referred to the 2008 exhibition at Musée Municipale, St Roche-sur-Yon, that included Horace’s paintings, which he reviewed for Print Quarterly in 2009. More historical evidence came from Wayne Pickering stating that the figure could be an infantryman (1852–1873), thus ruling out Claude-Joseph, but not necessarily Horace, as the artist. Betty Elzea guessed the date the work was painted to be about 1870–1875, and Oliver Perry traced a coloured print in the Illustrated London News, 18th October 1856, after an original by G. H. Thomas. There was a lively discussion between Martin and Jenny Spencer Smith as to whether the print was a copy or an original when Jenny proposed that the attribution of the work be altered to after George Housman Thomas. Andrew Greg agreed and referred the painting to the Portraits: British 19th C group for their views. Richard Green compared sizes of the painting with the chromolithograph, found them to be virtually the same, and verified the source copy to be a print rather than Thomas’s original painting. Oliver recalled an online impression with Thomas’s name painted below the image, but could not trace it. Andrew concluded that the Sheffield painting is a copy of the print after George Housman Thomas (1824–1868), and can be described as ‘after’ Thomas. Museums Sheffield was happy for the painting to be described as ‘after George Housman Thomas (1824–1868)’, thanked everyone for their comments, and the Art UK record was updated. Did Horace Vernet (1789–1863) paint 'A French Soldier'?